The automotive market is filled with compact crossover sport utility vehicles, a segment typically identified as five-passenger front- and all-wheel-drive models. Top models include the Toyota RAV4, Ford Escape, Honda CR-V, Chevrolet Equinox and the Nissan Rogue. The Mitsubishi Outlander also competes in this segment, bringing an all-new model to the market for the 2014 model year. It was not until 2003 that Mitsubishi introduced the Outlander, a model that showed up several years after the compact SUV segment took hold. Late to the party, the Mitsubishi Outlander has had to play catch up, something that it hopes its third-generation model will finally accomplish for the 2014 model year. The first generation Mitsubishi Outlander was a five-passenger model, sold in front- and all-wheel-drive configurations. Powered by a 2.4-liter four-cylinder engine paired with a four-speed automatic transmission, the 2WD Outlander was rated a combined 21 mpg, poor by today’s standards, but close to the mark of what its competitors were offering at the time. In 2007, the second generation Mitsubishi Outlander was introduced, bringing with it two important changes: a standard 3.0-liter V-6 engine and room for seven. Beginning in 2008, a four-cylinder engine was added to the lineup, paired with a continuously variable transmission and rated a combined 25 mpg. 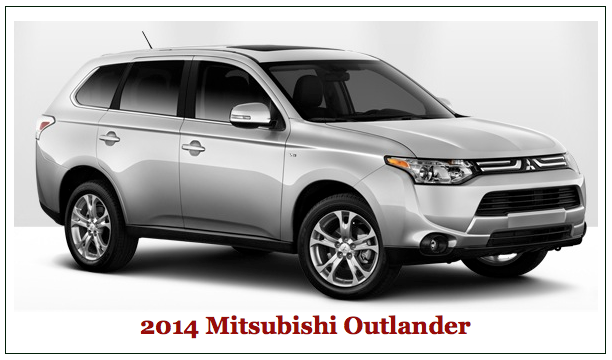 The 2014 Mitsubishi Outlander represents the third generation of this model line. Three-row, seven-passenger seating remains standard and the previous engine choices return with some refinements. Like other compact models offering three rows of seating, the last row is best occupied by small children. The all-new Mitsubishi Outlander is sold in ES, SE and GT versions. The ES is front-wheel-drive, the GT is all-wheel drive while the SE can be had in either driveline configuration. Both ES and SE versions are outfitted with a 16-valve 2.4-liter four-cylinder engine. This engine, of aluminum construction, is rated at 166 horsepower at 6,000 rpm and 162 foot-pounds of torque at 4,200 rpm. It is paired with a continuously variable transmission. Choose the Mitsubishi Outlander GT and your SUV is powered by a 24-valve, 3.0-liter V-6 engine paired with a six-speed automatic transmission. This engine, also of aluminum construction, is rated at 224 horsepower at 6,250 rpm and 214 foot-pounds of torque at 3,750 rpm. EPA estimated fuel economy is 25 mpg in the city and 31 mpg on the highway for a combined 27 mpg. These numbers are for the FWD Outlander. Choose the AWD Outlander SE and your fuel economy rating measures 24 mpg in the city and 29 mpg on the highway. The Outlander GT delivers an estimated 20 mpg in the city and 28 mpg on the highway. Regular grade gasoline is recommended for all models except the GT which runs best when fueled with premium grade gasoline. All models are equipped with a 16.6-gallon fuel tank, giving the Mitsubishi Outlander a maximum range of approximately 515 miles. That’s nearly enough fuel to take you from Denver to Salt Lake City on one tank of gasoline. The all-new Mitsubishi Outlander sits on a 105.1-inch wheelbase. This crossover model is 183.3 inches long by 70.9 inches wide by 66.1 inches high. The Outlander has front and rear tracks measuring 60.6 inches and offers an 8.5-inch ground clearance. Front headroom measures 40.6 inches to 38.4 inches in the second row and 35.7 inches in the third row. Front leg room comes in at 40.9 inches to 37.3 inches in the second row and 28.2 inches in the third row. Front shoulder room measures 56.4 inches to 56.0 inches in the second row and 50.6 inches in the third row. Hip room comes in at 52.6 inches in the first row, 51.7 inches in the second row and 39.4 inches in the third row. Outlander passenger volume measures 128.2 cubic feet. Standard cargo capacity is 10.3 cubic feet expandable to 34.2 cubic feet with the third-row seat folded down. Curb weight ranges from 3,274 to 3,571 pounds. Towing capacity is 1,500 pounds across the model line. Standard equipment for the 2014 Mitsubishi Outlander includes halogen headlamps, automatic headlights, heated side mirrors, rear privacy glass and 16-inch steel wheels. Trim line upgrades bring in high-intensity discharge headlights, side mirror turn signal indicators, chrome beltline molding and 18-inch alloy wheels. Inside, the Mitsubishi Outlander offers standard cloth seating surfaces with leather optional. An LCD display, dual-visor vanity mirrors, front map lights, a rear cargo area lamp and adjustable front seats are standard. Also available is an 8-way power driver’s seat. Automatic climate control, steering wheel mounted audio controls, a tilt and telescopic steering column, cruise control, power windows and door locks, and two 12-volt outlets are standard. Also available are a nine-speaker, 710-watt Rockford-Fosgate audio system, a seven-inch display navigation system, Bluetooth connectivity, a rearview camera, and a power remote tailgate. For the first time, Mitsubishi will sell a plug-in hybrid model. The Outlander PHEV features a pair of 60-kilowatt electric motors and a lithium-ion battery pack. This model goes on sale in 2014. Photo courtesy of Mitsubishi Motors North America, Inc.